The product has been available in Europe since 2013 for reducing seizure frequency in dogs with idiopathic epilepsy. The FDA Center for Veterinary Medicine announced today that it has approved the Boehringer Ingelheim product Pexion (imepitoin tablets) as an effective treatment for noise aversion in dogs. Pexion will be available by prescription only and is administered to the dog twice daily starting 2 days before an expected noise event and continued through the day of the event. The medication is available in 100- or 400-mg scored tablets and dosed according to weight. According to the FDA, the efficacy of Pexion was evaluated in a study of client-owned dogs with a history of noise aversion behaviors. As part of the study, the dogs received either Pexion or a placebo twice daily for the 2 days preceding and on New Year’s Eve, when fireworks events were scheduled. The owners evaluated their dogs’ responses to the fireworks at 4 predetermined intervals and scored the level of 16 different behaviors. The overall score for the dogs that had taken Pexion was lower (ie, better) than the score for those that received the placebo. The owners also evaluated the overall effect of treatment compared with previous New Year’s Eve fireworks experiences with the dogs. The owners of 66% of dogs given Pexion scored the overall treatment effect as excellent or good, compared with just 25% of dogs that received the placebo. The most common adverse events (AEs) seen in the study were ataxia, increased appetite, lethargy, and vomiting. However, the owners of 3 of the 90 dogs that received Pexion in the efficacy trial reported that their dogs became aggressive, which included growling at a young child and lack of restraint or self-control toward other dogs. The FDA warns that certain drugs used to reduce anxiety, such as Pexion, may lead to a lack of self-control of fear-based behaviors and thus result in an altered aggression level. The label information accompanying Pexion notes that pet owners should observe their dogs carefully during treatment. 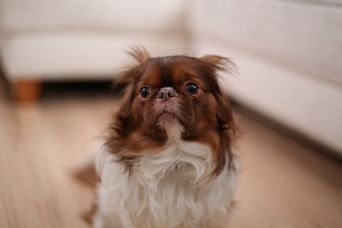 The agency recommends that veterinarians and owners of dogs that experience AEs should report them to the manufacturer, who is required to report them to the FDA. Veterinarians and pet owners can also file a report directly with the FDA by following the instructions at How to Report Animal Drug Side Effects and Product Problems. Pexion was approved in Europe in 2013 as an alternative therapy to reduce seizure frequency in dogs with idiopathic epilepsy. An application for expanding the Pexion label in Europe for “the reduction of anxiety and fear associated with noise phobia in dogs” has been submitted.